Get Ready to fall in love with this beautiful, originally designed vacation rental in Port Angeles! Handcrafted with native Oak, Cedar, and Fir timber, as well as Honduran and African mahogany, this "House of Woods" has 3 bedrooms, 2.5 baths, and sleeps 8 guests. The windows in 2 separate living rooms offer stunning views of the Strait of Juan de Fuca and Olympic Mountains. The inviting ambiance of the interior, spacious grounds and outdoor seating make this house perfect for a relaxing retreat! The intricately designed entryway welcomes you as you step into your new home-away-from-home. Sink into one of the plush recliners in the main floor living area and enjoy watching a movie on the flat-screen TV in front of the fire or turn your attention to the water and mountain views from the large picture windows. The fully equipped kitchen provides everything you need to whip up your favorite meals including two ovens, a microwave and dishwasher. Set the adjacent dining room table to share family dinners, or take your plates outside and enjoy your meal with a view. Make your way inside to the second-floor living room for a nightcap. 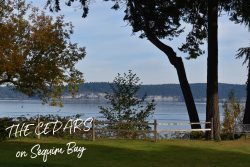 From here, you can see the Strait of Juan de Fuca while you indulge in a glass or two of wine, watch TV on the flat screen, or a game of cards with friends. Retreat either to the king bedroom with its en-suite bathroom, the room with two queen beds, or the room with the full antique bed. Each room provides a pleasant view for you to wake up to each morning! Just a 30 minute drive west are Lake Sutherland and Lake Crescent. Surrounding the picturesque lakes, you'll find numerous hiking trails that lead to other beautiful areas in Olympic National Park, including Sol Duc Hot Springs, Hurricane Ridge and Marymere Falls. The Olympic Discovery hiking and biking trails are within walking distance from the home, housing paths that stretch from Port Angeles all the way to Pot Townsend. Enjoy one of the prettiest 5 mile stretches of the trail along the waterfront from the home to downtown Port Angeles. If you love animals, head over to the Olympic Game Farm which is 20 minutes from the property. The drive-through wildlife exhibit features llamas, Tibetan yaks, zebras, Kodiak bears, Roosevelt elk, Sika deer and American bison! Pick up a loaf of bread at the entrance and feed the animals as you go for an extra special experience! Not even a 15 minute drive away, is downtown Port Angeles which is home to delicious restaurants like Sabai Thai, Kokopelli Grill, Next Door Gastoropub and BarHop Brewery. Wander out onto the City Pier where you can explore the Feiro Marine Life Center or just bask in the salty sea air! Enjoy further Northwest day adventures out to the Pacific coastline beaches and the Hoh Rain Forest, all just under a 3 hour drive from the home. Other popular destinations around the area include the Dungeness Wildlife Refuge and Spit, Salt Creek Recreational Area/Crescent beach, Hollywood Beach, John Wayne Marina, 7 Cedars Casino, Elwha River Casino, and more. Trash bags and starter roll of paper towels are provided. Please note the home is not very suitable for infants or young children. The homeowner requires children be at least 5 years or older to stay. Nightly rates are based on 4 guests, with an additional nightly guest fee for each guest up to 8 max.